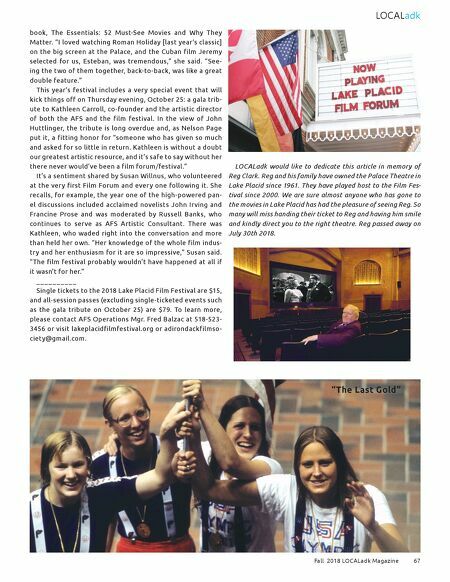 Fall 2018 LOCALadk Magazine 67 LOCALadk book, The Essentials: 52 Must-See Movies and Why They Matter. "I loved watching Roman Holiday [last year's classic] on the big screen at the Palace, and the Cuban film Jeremy selected for us, Esteban, was tremendous," she said. "See- ing the two of them together, back-to-back, was like a great double feature." This year's festival includes a ver y special event that will kick things off on Thursday evening, October 25: a gala trib- ute to Kathleen Carroll, co-founder and the artistic director of both the AFS and the film festival. In the view of John Huttlinger, the tribute is long overdue and, as Nelson Page put it, a fitting honor for "someone who has given so much and asked for so little in return. Kathleen is without a doubt our greatest artistic resource, and it's safe to say without her there never would've been a film forum/festival." It's a sentiment shared by Susan Willnus, who volunteered at the ver y first Film Forum and ever y one following it. She recalls, for example, the year one of the high-powered pan- el discussions included acclaimed novelists John Ir ving and Francine Prose and was moderated by Russell Banks, who continues to ser ve as AFS Artistic Consultant. There was Kathleen, who waded right into the conversation and more than held her own. "Her knowledge of the whole film indus- tr y and her enthusiasm for it are so impressive," Susan said. "The film festival probably wouldn't have happened at all if it wasn't for her." _ _ _ _ _ _ _ _ _ _ Single tickets to the 2018 Lake Placid Film Festival are $15, and all-session passes (excluding single-ticketed events such as the gala tribute on October 25) are $79. To learn more, please contact AFS Operations Mgr. Fred Balzac at 518-523- 3456 or visit lakeplacidfilmfestival.org or adirondackfilmso- ciety@gmail.com. LOCALadk would like to dedicate this article in memory of Reg Clark. Reg and his family have owned the Palace Theatre in Lake Placid since 1961. They have played host to the Film Fes- tival since 2000. We are sure almost anyone who has gone to the movies in Lake Placid has had the pleasure of seeing Reg. So many will miss handing their ticket to Reg and having him smile and kindly direct you to the right theatre. Reg passed away on July 30th 2018. "The Last Gold"